My head is still spinning from going to the Jane Austen Society of North America’s Annual General Meeting last week and I’m in the middle of moving (again) as my husband’s been relocated to a new state! After 8 weeks of him being there Monday-Friday and sometimes being home less than 36 hours, we were excited to spend some time together at AGM. It was touch and go with childcare, but things finally worked out to leave our kids at home. AGM was great as a Janeite and the author side of me is super pumped for writing. Unexpectedly, it was also great for my marriage. My husband gave me reasons to fall in love with him all over again. He is actually quite Darcy-like and is introverted and reserved. He is sometimes shy about meeting new people. He hates small talk, meeting new people and being on display. I begged him to come with me back when I registered because I was nervous about meeting new people. He’s not a JASNA member so he couldn’t come to all the activities, but I had thought I’d end up all alone and he’d save me from certain misery at the end of the day. Fortunately, in the intervening months I became closer friends with other AGM attendees. Finally meeting them in person was a dream come true! My husband proving his excellent character and gentlemanliness was beyond anything I could imagine. He already spends every weekend taking care of the kids so I can write. He also does most of the laundry and the dishes. He reads everything I write and lets me hash ideas with him. He went above and beyond during AGM. He never batted an eye when I volunteered him to help us set things up and never complained when I left him all day for activities and then most of the night for girl time. He was quick to offer his help to me, my new friends, and random people in the elevator. He didn’t get to relax very much. He dressed up in a suit. He talked to strangers. He danced with me! All for me. He’s not the most romantic guy, but I know he loves me a lot and will always be my best friend, my most ardent supporter, my defender and my rock. I just have to listen to the way he’s telling me he loves me. “Much as I respected them, I believe I thought only of you.” -Pride and Prejudice, Chapter 58. Please, no one take this too seriously. I’m not out to start some kind of Darcy war. For all our Janeite rabid protectiveness of Mr. Darcy- and I even had a blog called The Darcy Obsession- I feel compelled to remind us all that he’s really a fictional character and it’s pretty possible real life men can be even better. 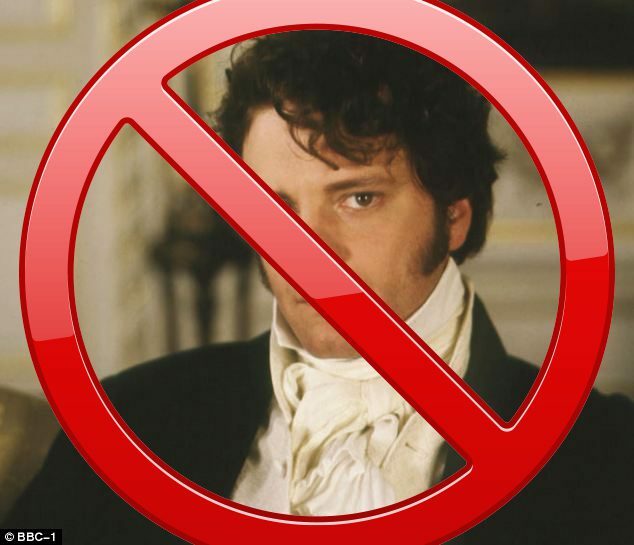 So here’s my list from my own personal Mr. Darcy in comparison to the Metro article 10 Reasons Why Mortal Men Will Never Match Up to Colin Firth’s Mr Darcy. Note: I’m intentionally, and exaggeratedly, snarky to match the tone of the Metro article. 1. He can take it ALL off for me. Ok, so usually this means he walks around the house in his boxer briefs from the second he gets home at night to the absolute last possible second he has to dress for work, but there are times when it all comes off. I’m not left wondering what’s under a giant, wet, not see through shirt. And unlike Firth’s iconic scene, our less than properly clothed time is totally part of our script. Keep your fantasies of what Firth has under a baggy piece of linen. I’ve got a big hunk of real life manliness to keep me occupied and fuel my dreams. Eat your heart out. 2. He knows my name. Our wedding! December 18, 2004! Oh yeah, I can run my fingers through them any time. And that thing I do? Yeah, he really likes it. So stare at Colin Firth’s mop top that frequently looks like it needs a good washing and a comb. I’ll keep this. Oh, and it’s really LOVE and not just school girl lust because his is starting thin and yet I still love him. My guy had a full on beard at 17 in high school. In fact, the girls in our government class declared the two boys in our class should not shave for a week, which they happily complied with when 10 pretty girls say please, and we happily reaped the benefits. The other boy only got to a respectable level of scruffy but my husband- we weren’t even dating yet- had a real beard. Yeah, I’m going to be honest and say that contributed to my choice. That’s a lot of manly testosterone pumping through his system. Yum. I didn’t even know how to make my own cup until last year. This man has been making me coffee for years. In the morning. As he wakes beside me each and every day. Sometimes we fought the night before. Sometimes we had quite a good night kiss. Sometimes I was up all kinds of hours nourishing his children with my body. He’s there, he’s real and he has a cup of steamy all betterness in his hand. Thanks for filling up, honey. I think we need an oil change, dear. Oh, you vacuumed the whole car and found what appeared to be two packages of crackers and then five whole packs of raisins under the car seat? Thanks for taking care of that! They’d be teenagers before I cared. And then he will walk on the wild side and ride a motorcycle. Being goofy with our son. Blue. Enough said. But, wait, there’s more. It’s not a common shade of blue and he has such looooong eyelashes. 8. He’s more photogenic than me. Seriously, I blink in every picture. And that smile? It cost his parents a few thousand bucks but now I swear there’s that cartoon “ting” every time he smiles. Funny, Firth never smiled. Not even once. Irish Spring and Old Spice deodorant makes a lovely combo. Honorable mention is that sometimes he uses the Fitzwilliam Darcy Soap I bought him from Shirley’s Handicrafts. 10. He actually looks nice. Firth takes Darcy stand-offishness to a whole new level. I can’t decide if it’s painful constipation or if he’s plotting ways to kill people in the woods. Dexter may be more cuddly. Whether you have your own Mr. Darcy (or other Austen hero) or are still looking, I encourage you to take heart. Mortal men can be loving, respectful, kind, generous and unselfish. Of course, there’s nothing wrong with daydreams of whichever hero you prefer and the actor of your choice. The nicest thing about this post is reading of true love in real life. Being married for 47 years this past August, I can say I have seen few romantic couples of our age. Yes, I know many who are together but…..
Well, I don’t know how romantic we will be, or have been, but I think we will always be best friends and partners. We got married very young and were in college at the time. I had married professors who didn’t seem to understand the level of commitment I had to my marriage. For me, it was not some life event that was to accepted and tolerated if it could balance with my plans for self and career. This was especially the case when I was pressured to apply for law school. I just don’t think I could have balanced it all and I certainly didn’t want the degree over the marriage. Fast forward years, ups and downs- financial and otherwise- and I have a career I love that gives me wonderful personal fulfillment and isn’t overly taxing on my marriage. Love your post and yes, my DH is my Darcy. And before he introduced me to Jane Austen’s Pride and Prejudice I had been researching his family tree and found out he was descended from Norman Darcy (1031 – 1061), which meant nothing to me. That blew my mind when I read P&P, though. My Darcy is a real introvert and is very often misconsrtued as being haughty and I actually couldn’t stand him the first few years I knew him. Now, I wouldn’t trade him…he does dishes and laundry and even cooks dinner. Aw, sounds like the perfect Darcy! I agree, I didn’t like my Darcy at first either. And there are actually times when he IS feeling proud and haughty. And He can be conceited and have a big ego (seriously, his bosses should quit stroking his ego). But a lot of the time when people assume that’s what’s going on is when he’s just content to watch the crowd or even be nervous. He’s a complex man, I always thought that about Austen’s Darcy too. How cool that your Darcy is related to a Darcy from Normandy! Like you, I have a real man by my side who is far, far better than my favorite fictional hero. He is my inspiration, both in a general sense and literally. It is HIS poem written for me that ended up in my fourth book as a poem written by Darcy for Elizabeth. It is HIS many, many romantic words, actions, and gestures over the past 30 years that made their way into Darcy’s words, actions, and gestures. I loved getting to know your mister! What an amazing man to have inspired your Mr. Darcy! Lovely post, Rose. Maybe next year I’ll make it to AGM and drag my hubby along too. I have one minor correction to what you said about Colin as Darcy. Firth did smile … once … in the carriage after the wedding, right before he kissed Elizabeth. I think that’s the only time, though. Well, that’s true. He smiles when he’s leaving the church too. And a lovely smile it is! But there are many times in the book that he smiles and it doesn’t show up in the series. 🙁 But during the actual winning Elizabeth’s heart part, he just glowers at everything and everyone. Aha. I had expected more complaints about this post and now I’ve finally got one. Well, of course, I’m prejudiced in thinking that my own husband is better than an actor’s portrayal of a fictional character that was written out of the mind of someone else. For that matter, I’m a writer and so I have my own interpretation of everyone in the book and think it would be rather impossible for someone else to entirely achieve what’s in my head. If, as a reader, I had thought someone got every nuance perfect and explored every nook and cranny of the book, there would be nothing for me to write. As a writer, my understanding of the text continually evolves as I delve deeper and deeper and wonder if I can twist something just half a degree. As for the rest of your comments, I have to respectfully disagree. I’ve seen the adaptation, many times, and while I at one point preferred its mirroring of scenes from the book, I never felt Firth’s portrayal was perfect or very close to how I saw Darcy from reading the book, which I did with much more frequency than watching media portrayals. A smirk is not a smile. I will give due for the scene at Pemberley being moving and touching, but I do not see an actual smile…and it’s also not a scene from the book. Many scenes for Firth in the series are not from the book. In fact, they make him a much bigger character than Austen did. I know I do that all the time as a JAFF writer. However, when the topic is the faithfulness of the series, and Darcy’s character, in particular to that of the original it is a different matter. The fact is, out of the 69 instances of smiling in P&P 21 are Elizabeth’s, and about half of them are forced, fake or reluctant, and 11 of them are Darcy’s. I believe he smiles the second most out of anyone, even Jane who is recorded as smiling too much. In nearly every exchange he has with Elizabeth, Darcy smiles. Firth just fails there. It is one thing to know that Elizabeth must have interpreted the smiles very differently than a non-prejudiced reading of the text shows and to have the adaptation follow that suit but then including non-canon scenes of Darcy only point of view ruins the effect that we see the story only through Elizabeth’s lens. If it is not to be only from Elizabeth’s lens, as the book is, then why remove the scenes which shows Darcy’s much more gentler and open demeanor which everyone but Elizabeth, Mrs. Bennet and Mr. Wickham saw? If it were a book and not a screen play and I were the editor I would point out the inconsistency there. Oh dear, do you react this way every time when someone disagree with you? And ‘expected more complaints’? So it was provocation or you are so certain of your opinion, and everyone who dare not agree with you is wrong. Apparently we have a big disagreement here and not only about smiles. But it is hard to discuss it with someone who is so prejudice (and to whom smile is only when someone giggles or shows his teeth, subtlety had gone out if the window)! And why you blame actor for which scenes where in movie and which weren’t? It is quite ridiculous. Myia, I had expected more complaints because I was snarky, matching the tone of the Metro article. I have a disclaimer about it. We interpret Darcy differently and have differing favorite portrayals of him. Your reply was about the number of times he smiles and so I commented on that portion. This is not remotely the total amount of tally of what I like or dislike about Firth’s portrayal. It was 100% to match the Metro article claiming no mortal man can be equal to him. And that I have a rather large problem with, because my husband is very human and I think out-does Firth on the Firth-is-a-god list. I have not promoted another actor over Darcy or another adaptation over the 1995 series. This has been entirely about my husband. I cannot help it if you read things into this discussion which I did not write. I wrote the first draft of this months ago, when I first read the Metro article. Last weekend at AGM he just proved how much I really should brag about him. But yeah, I’m crazy enough with my book obsessions. I need my man to be real. What a GREAT post!!! so glad you shared! Thanks, Rose, for the kind words about your husband. I have a great guy as well. One woman we knew called him “The Million Dollar Man.” He does a lot for his family, and I love him. Now, if he actually came with a million dollars then he could really give Darcy a run for his money! Wouldn’t you know after I prepped this post we got into an argument over something stupid (what time of night it was) but on the whole, I’ll keep him. Glad you’ve got a good one too! Delightful! Having met your hubby at AGM, I agree you found a keeper. I will have to bring mine next year as I think they would get along well! I agree, it’s wonderful to have men who support us and love us unconditionally. Sounds like you had a wonderful time at the AGM. I owe so much to Elizabeth Bennet and therefore Jane Austen. I didn’t have a lot of good relationship role models growing up but I read P&P around the same time that I first met my husband (about a year before we started dating). Her self-respect did influence my opinions on relationships. What a lovely post, Rose. He certainly sounds like a keeper! The JASNA AGM sounds like it was a lot of fun and I’ve thoroughly enjoyed seeing the pictures and posts on FB recently. Mine is more Bingley than Darcy in character, with a touch of Brandon and Knightley for seasoning. I begininning to think he may be a keeper too, having clocked up 38 years of marriage and 41 as a couple so far I’m the one with the Darcy tendencies and the shyness I still experience when meeting new people or am in a large group can come over as standoffish at best. Hope all goes well with the move for you all. Lol! Think of how exhausting it would be to start over after 41 years? Surely that swings it in his favor! 😉 It’s worse for my husband in this area. People know his name and his father and they make assumptions etc. It really gives me a way of looking at Austen’s Darcy. I hope you can come to AGM next year! It was a blast! Sadly I don’t think the AGM is ever going to happen for me. You see, I live on the other side of that rather large pond called the Atlantic Ocean. Yes, breaking in a new partner after all these years is not a prospect to contemplate! Hahaha, Leenie! You could make him read this. Maybe then he’ll read your wonderful books! I had a list of my ideal mate from 14 on. I never thought “carrying books all over a hotel” would need to be an important quality but I think quite a few of us were very grateful he was there! I have met Mr. Fairbanks and can honestly say that Rose won the husband lottery. He is kind, funny, and was helpful to so many of us and NEXT YEAR I heard a rumor he will be dressing up in a military uniform. #JaneOn! YOURS should show up next year and a naval uniform should be right up his alley! Here’s to the men behind the awesome AuAu women! Rose, your hubby does sounds like a keeper! 🙂 Glad you had a great time at the AGM! Thanks! It was so fun! I’m still a bit high on it! Aww! What a beautiful post! Thanks! I’ve got such a great support system. Wonderful husband and an awesome editor! I don’t think I realized when we got married how much he was like Mr. Darcy. My obsession wasn’t so strong then. But really, it can be…unsettling…how alike they are. Down to his mother dying when he was young, his father’s inattention etc. Darcy is definitely my book husband but I say Tilney is my book boyfriend and Wentworth is my book obsession. I need to come up with a name for Knightley because I like him a lot too. I probably shouldn’t have so many of those men in real life though, should I? Very sweet article Rose 🙂 Sounds like you have a very loving family. I hear that a lot from readers and I think it’s because a lot of serious readers are introverted. It is true what they say about opposites attract, after all. That being said, when I take a personality test I actually come out as introverted and I do think that’s true for Elizabeth. I think Elizabeth just tried harder more frequently in the company we see her in. That’s what impressed me the most with my husband last weekend. He was trying hard to be socialable and it was for me. If it was just a matter of meeting new people because we were at a party or something he wouldn’t have put himself out there as much. And I really appreciate that he sacrificed his comfort that way.